This is a piece working to a brief. The Eagle gallery themed exhibition “Encounters” was to produce a piece of work as a response to (not a copy of) a work by a well-known artist. The piece had to be accompanied by a small A5 caption giving reason for the piece. What follows is the text thereon. Apple Tree Form, Andrew Naish, 2014.
interpretations of felled trees and the like. A large trunk shape fills the centre of the picture left to right with drawn detail of some severed root structure as though a portrait as the centre of attention. 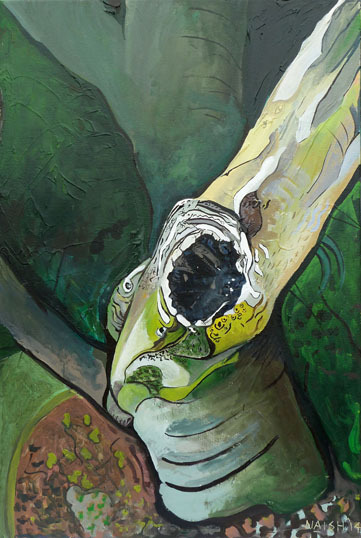 With “Apple Tree Form” I have attempted to use his colour palette and adopted the interest in the grotesque. This apple tree at the bottom my mother’s garden, has had this large black scar of a long removed branch for the forty years that I have known it. I hope that I have seen it at least partially in a ‘Sutherland’ way, interpreting its nightmarish shapes with a certain quality of line and form. It was an interesting exercise and I think if I had the chance to do it again, I would have gone further afield to find a more aggressive source image. The tree form I used is somehow too benign to fit in with Sutherland’s cannon of miss-shapes and evil forms. I enjoyed the process though, as I used three pieces of reference material. Firstly, a re-production of Sutherland’s picture – blown up to its approximate size so that I could understand his brush stroke sizes better. The second was some photographs of the tree I was representing. And finally a pastel sketch I had done of the tree scanned in and framed to the proportions of the canvas that I used. I’d dip in and out of these. This is not really a painting I would have attempted had I not been asked too, but I’ve certainly learnt a bit about lines in pictures, not detailing the whole image and adding faces etc ‘hidden’ in the piece.